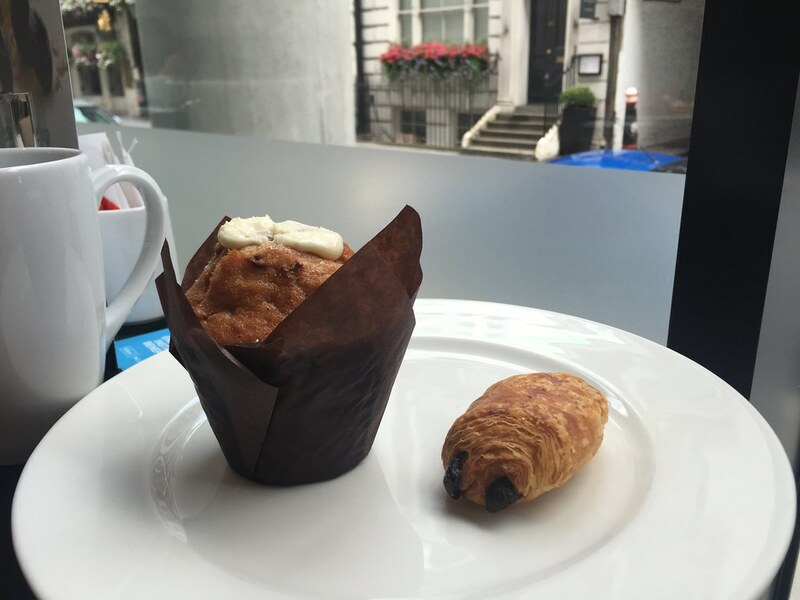 Choosing a hotel in London can be like finding a needle in a haystack (a very polished haystack mind). You’ve got 100s upon 100s of hotels, apartments, B&Bs and hostels to browse, so it can be tough to narrow it down. 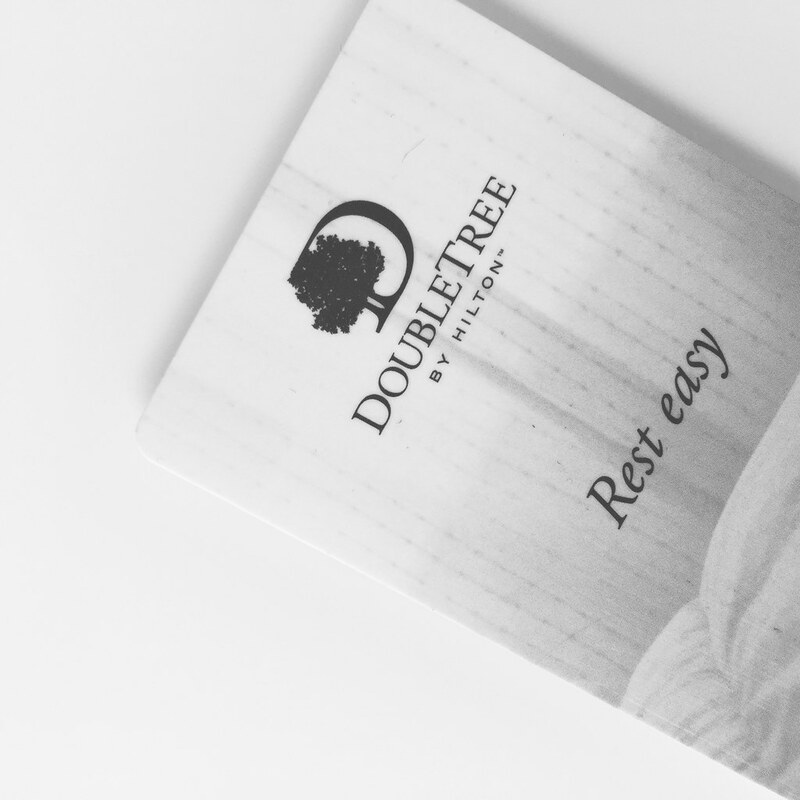 I’ve stayed in a fair few now but today I’m writing about one of my regulars which is the Doubletree Hilton at Tower Hill. As you’ve probably guessed from the name, it’s located next to the Tower Bridge so Tower Hill tube is the closest on the District and Circle line. Alternatively you can easily reach Aldgate tube for an extra couple of minutes walk. As for location, it’s one of the main reasons I love this hotel. 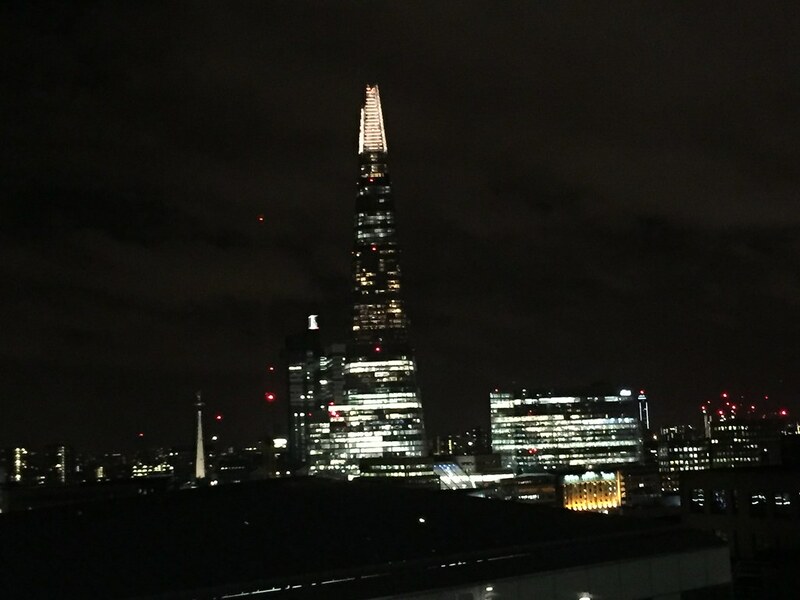 London is pretty built up but I love the openness of Tower Hill and having the Thames in view is so relaxing and makes for a great morning run or a midnight walk taking in the beauty of the London lights. it’s also surrounded by landmarks and iconic buildings. Aside from the Tower Bridge, you’ve got The Shard, the Tower of London and The Gherkin on either side and in the morning, you’re likely to hear St. Paul’s chimes. A few streets back from all of the tourist commotion is the hotel, situated on a pretty cobbled, Pepys Street. If you’re new to the city, there’s always black cabs outside the reception to get you wherever you need to go. The wow factor starts from the front desk where the entire roof is one big skylight leading to the hotel’s atrium. Here you can check in, catch up on some emails, grab some food or just simply lounge. Check in was super speedy and in true Hilton style, the staff couldn’t do enough for you. We were luckily upgraded to an exec room after being picked as guest of the day which gave us a whole lotta perks. Aside from the welcome cookie, an exec room also grants you access to a few other benefits, including breakfast included, free newspapers, robe and slippers and access to the executive lounge with canapés and an open bar (serving wine and beer) in the evening. Being guest of the day also gave us a free drink in the hotel’s Skybar which I’ll get onto later. We arrived pretty early for check in. It’s officially at 3pm however we arrived at 11am after an early train journey down from Manchester. So I was fully expecting our room not to be ready however we were pleasantly surprised to find it was, which after leaving the flat over 3 hours earlier, was a relief to be able to drop our things off and freshen up before all of our plans that day. I’ll add here that I’m also a HHonours member which is free to join and means you can collect points for every night you stay and if you download the app you can choose your room in the hotel which I highly recommend should you be after a certain view (this sounds very forced but I’m not getting paid to write that - it’s just worth doing, promise!). By the looks of the lift, HHonours members enjoy the privilege of a higher floor in the hotel (yet another reason to join) so up to the 9th floor we went. 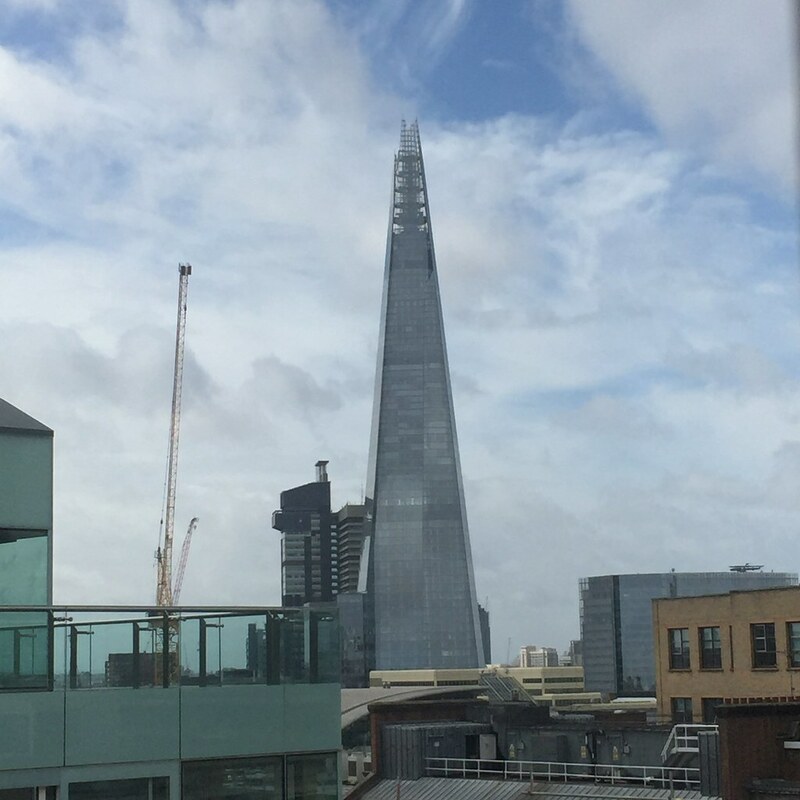 In terms of rooms, you can opt for one of many: a standard, king exec, queen exec or suite and you’ll either have an atrium view or an external view of views across the city. Unlike other hotels that offer internal views, the atrium views are not that as they’re flooded with light. Myself, I always love a view to wake up to in the morning, to read beside and to be wowed at during sunset. We stayed in a Queen Exec room overlooking the front of the hotel which is in, my opinion, the best. The back has the views of the Gherkin which is just as stunning, however at the front you’ve got the Tower Bridge and The Shard to take in. Since I last stayed the rooms have been undergoing renovation. 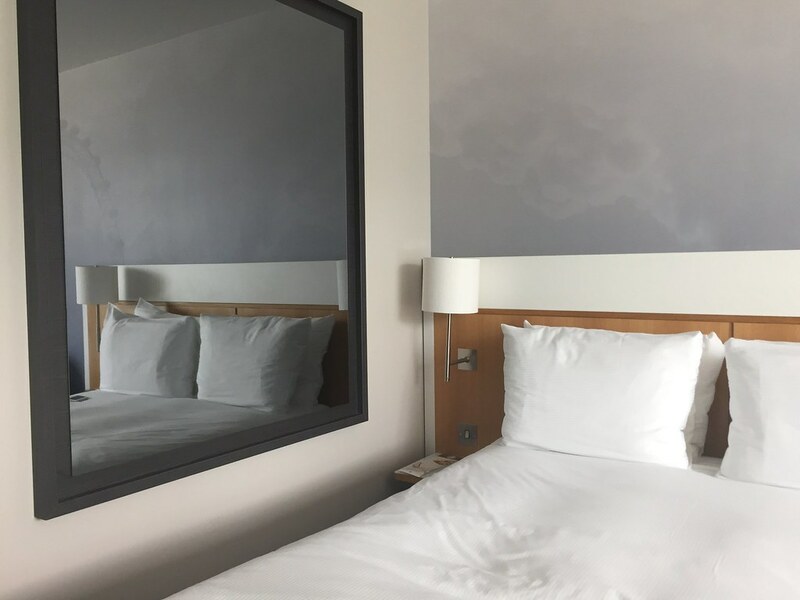 I liked the hotel before so the main differences I noticed were a couple of stylish updates in the form of a statement oversized mirror next to the bed, a marble coffee table (bloggers rejoice) and a 55 inch TV screen with even Sky Sports included. The only downside I found was that to memory, they used to have Macs in the room but these must have been replaced by the plasmas which make for better viewing but did mean I was short of being able to blog whilst I was there as I didn’t bring my laptop with me - but that’s my own fault for not checking. 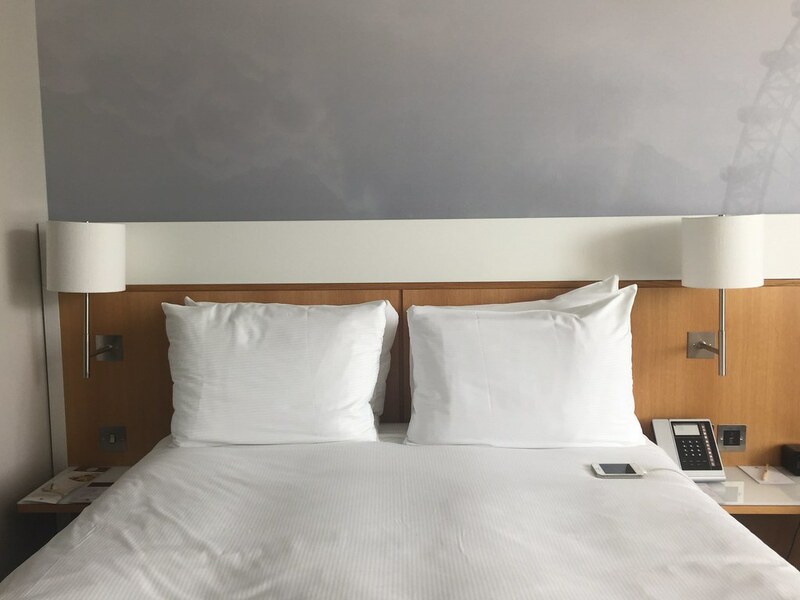 Aside from that, the rooms are beautifully designed in a minimalist style with everything you could want from countless hangers, a safe, iron, coffee making facilities, mini bar, hairdryer, magazines, the most dreamy bed and killer views across the capital. And the bathroom has your back too with all the toiletries you could ever need and fluffy towels a plenty. We headed down to check out the Executive lounge for a few drinks at 7pm. From 5:30 - 8pm the lounge offers canapés of cheese, crackers, grapes, meat platters and dessert (these may change daily or weekly however having only stayed for one night, I couldn’t tell you) alongside unlimited white and red wine and beer (and soft drinks too). It’s a key card only job so it’s a nice little haven away from the hustle and bustle of the rest of the hotel. You’ve also got newspapers and a huge TV to enjoy which meant the football for me. The lounge for me, is one the main selling points of upgrading your room as it’s great to have your own area and to make the most of the lovely wine on offer. We left the lounge at half 8 to check out the Sky Lounge which is the hotel’s famous rooftop bar located on the top floor (12). 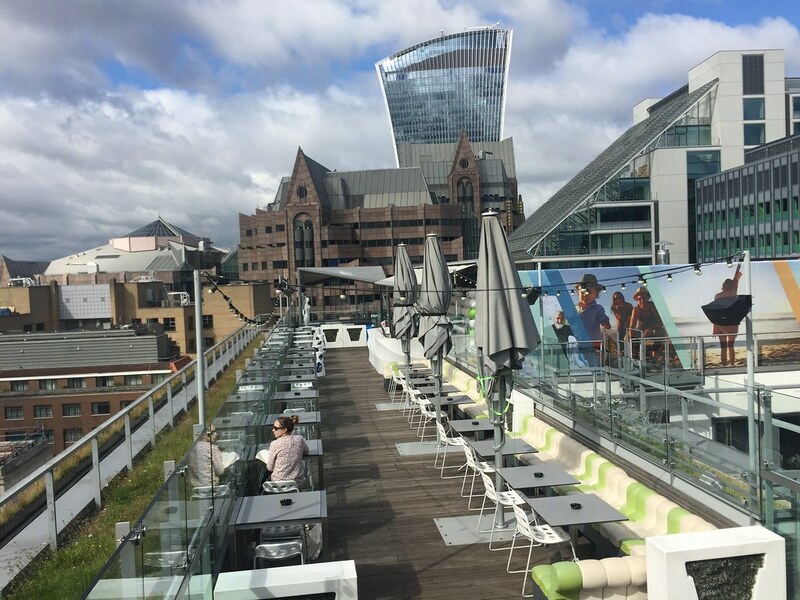 The Hilton Deansgate in Manchester has the same concept with their Cloud 23 bar however because Manchester does lack rooftop venues, that one can get crowded needing to either book weeks in advance or to be willing to queue for a while downstairs. London luckily has lots to choose from and I’ve never once witnessed a queue here. 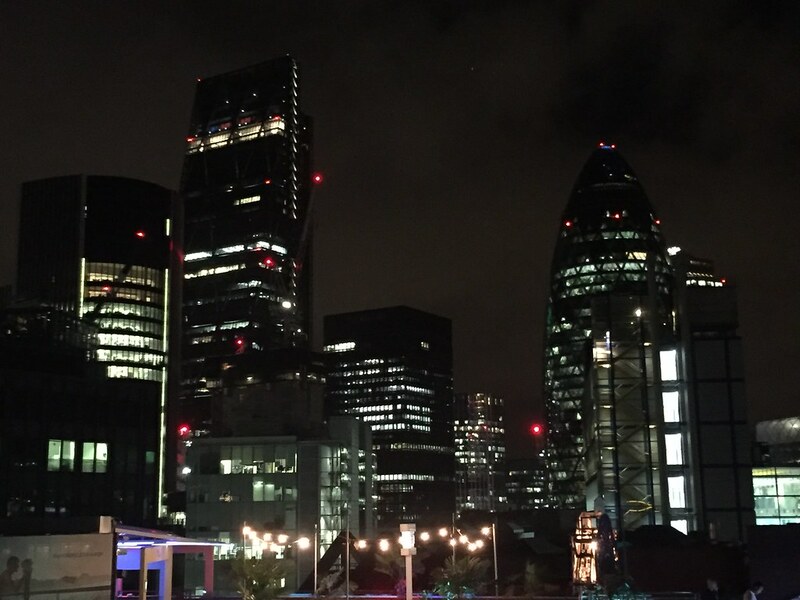 The Skylounge is another of the main reasons I come to the hotel as it’s a real asset and you’re spoilt with breathtaking views across the city whether you choose to sip on your cocktail at a table or venture outside onto either the wraparound bar or the roof terrace which has its own separate bar. If you’re met with chilly weather, do not fear as the hotel has patio heaters to keep you warm whilst you take in the iconic landmarks. Drinks here are what you’d expect to pay for one, being in London and two, being at a lovely location so you’re looking at £12-£14 for a cocktail. The bar shuts at 2am on a Saturday with the outside areas shutting at midnight and is a great venue for either drinks with your girls or a romantic evening with your other half. Next up was breakfast after an amazing night’s sleep. It’s only when I’ve been away from home do I realise how much I love hotel bedding and always want to source where it’s come from to replicate in my bedroom. Breakfast is served from 7am-11am on the weekends which is perfect for those who love a lie in (AKA me). It’s no secret that breakfast or brunch as it usually is by the time I eat it at home in the weekends. The hotel warns of the rush hour period but even though it was busy, we were seated within minutes next to a pretty cobbled London street. 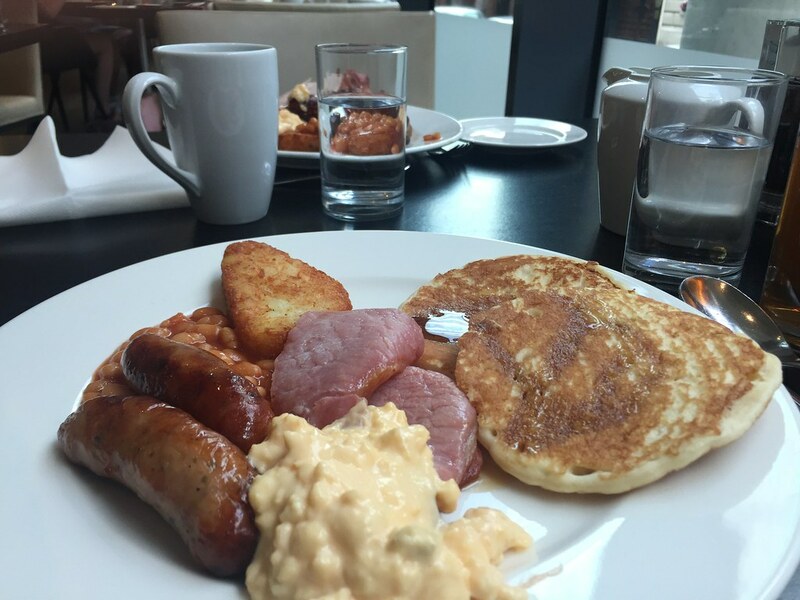 It’s a buffet style breakfast offering literally everything you could ever want from a full english to cereals, juices, fruits, pastries, muffins, toast, yoghurts and more. So in true ‘eyes bigger than my stomach’ form, I got a full English alongside a stack of pancakes with maple syrup, a muffin and a pain au chocolat. The food was so tasty, in particular the pancakes which were light and perfectly fluffy (and too moreish). We checked out at around 11am (official check out is 12pm) and we dropped off our luggage with the hotel - another great perk before our final day in the city. As you can probably guess from this write up - did I enjoy my stay? Yes. From check in to check out the staff couldn’t do any more for us and were super helpful and lovely with every request. The hotel has a lot going for it and I’ll definitely continue to stay there.